The first indication that withania somnifera is a bioactive plant is its name; somnifera means ‘sleep-inducing’ and can also be found in the Linnean name for opium poppies (papaver somniferum.) The second indication can be gained by observing how closely one of its alkaloids, withaferin A,⁽²⁾ resembles many of the body’s own hormones. Indeed, androgenic effects have been observed in ashwagandha studies recently showing increases in strength and muscle size over the control group.⁽³⁾ Small but perceptible increases in serum testosterone were noted. The hormonal effects of ashwagandha are most pronounced in diabetics and this effect has been confirmed in numerous studies. Researchers in 2008 induced diabetes in rats with streptozotocin, a drug which is well-known to modify insulin-producing β-cells in the pancreas. Some of the groups were then given ashwagandha root extract and the antidiabetic effects were rather startling.⁽⁷⁾ At 200 milligrams per kilogram the ashwagandha diabetic rats showed a 111% reduction in blood glucose to a value quite close to the normal range. The rats that received the 400 mg/kg dose did even better (Table 2). Moreover, ashwagandha root extract was able to significantly lower insulin as well in diabetic mice in a dose-dependent manner (Fig 1). Confirming the strong antidiabetic effect of ashwagandha and discovering a new pharmacological properties was a study published in Nature Medicine titled: Withaferin A is a Leptin Sensitizer with Strong Antidiabetic Properties in Mice.⁽⁸⁾ As the title suggests, Japanese researchers used one specific alkaloid from ashwagandha called withaferin A. They had been previously studying the the leptin sensitizer celastrol but found that withaferin A had similar properties. Obese rats fed withaferin A showed a 20–25% reduction of body weight and lean rats showed no decrease in body weight. The researchers attributed this to increased leptin sensitivity, the peptide hormone known to signal the body to stop eating. The administration of ashwagandha has been shown to markedly reduce cortisol levels (28%) in a 60 day study of 64 subjects. Standardized tests were given to the placebo and the ashwagandha groups and the scores indicated a significant reduction in stress. The ashwagandha groups saw anxiety test reductions of 69.7%, 64.2%, 75.6% and 44.0% while the placebo group had reductions of only 11.6%, 10.4%, −4.3% and 5.5%.⁽⁹⁾ This study indicates that ashwagandha has a strong anti-stress effect. Furthering this evidence was a pharmacological study which measured binding affinities of withania A on purified receptor proteins. 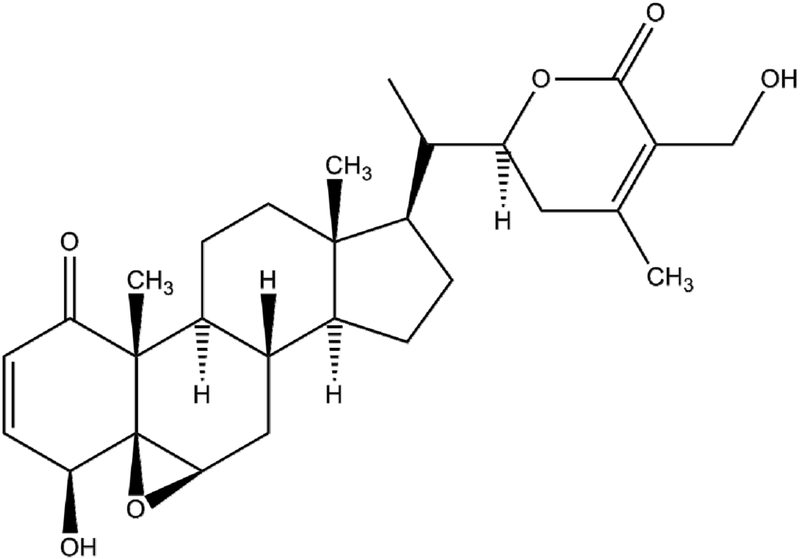 It was shown that withania A bound to the β1-adrenergic receptor nearly as strongly (8.1KJ/mol) as carazolol (8.5KJ/mol), a high-affinity β-blocker.⁽¹⁰⁾ This strongly implies that ashwagandha likely influences the β1-adrenalin receptor in the body as well. Pharmacologists are now beginning to confirm what Indians have known for thousands of years: ashwagandha is an anabolic, antiglycemic, anxiolytic, and anti-inflammatory agent. Interesting cancer research is being done⁽¹¹⁾ on ashwagandha and it has even been shown to reduce β-amyloid misfolding in Alzheimer’s Disease.⁽¹²⁾ It contains dozens of alkaloids and studies on any one isolated compound cannot truly represent the efficacy of the whole root. For advice on how ashwaganda can be added to smoothies and elixirs to optimise hormone health, sign up for Dr Allie’s free Hormone Balancing Elixirs and Smoothies Ebook or contact Dr. Allie.